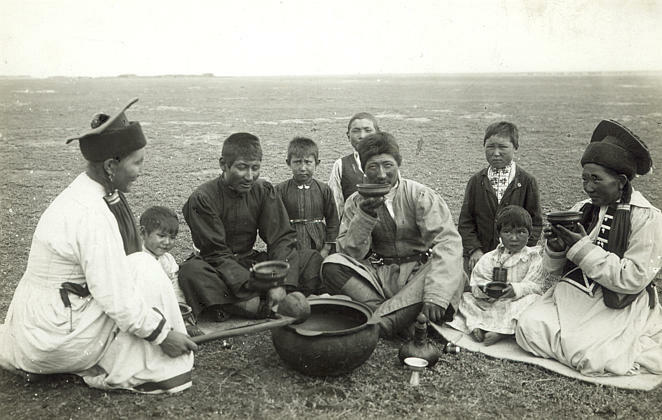 Khalkha, Daurs, Buryats, Evenks, Dorbots, Kalmyks, Oirats, Chakhars, Tumeds, Ordoses, Bayad, Dariganga, Urianhai, Uzemchin and Zakhchin. 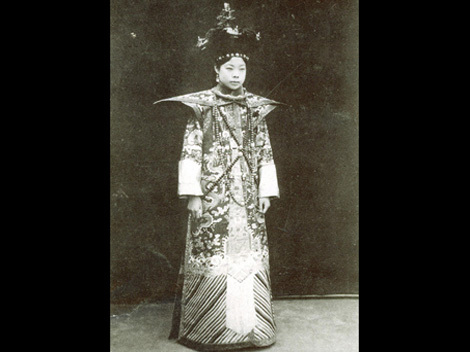 The name Monggol has its meaning in the Tungusic languages and usually means "the invincible ones". At first it was applied to a small and still insignificant tribe in the area of the Onon river. 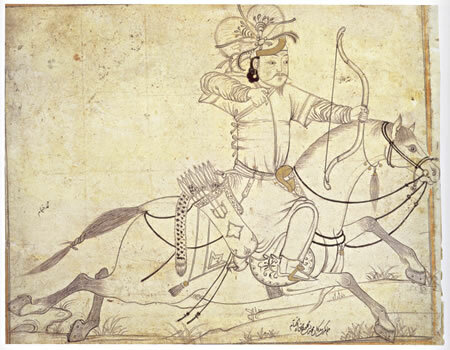 In the 13th century it grew into an umbrella term for a large group of tribes united under the rule of Genghis Khan. The polytheistic (believing in many gods) Mongols thought that good and evil spirits controlled the world. They also believed in a most important god, who ruled all the spirits. They called him Tengri (TENG gree), which means, "the great god of heaven". 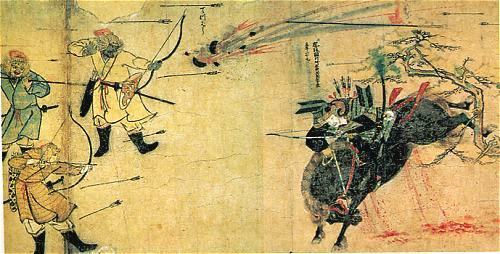 The Mongols lived in fear of the spirits and hoped for blessings from them. Every yurt had small idols made of felt. The wives and daughters of the nobles made these idols at sewing parties. The Mongols believed that these idols protected their families and animals. Before every meal they put food and drink on the idols' lips. They also prayed to them. 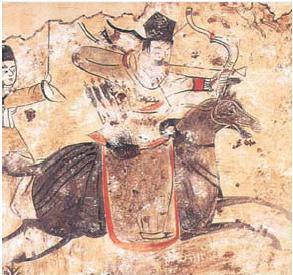 The Mongols believed that some men, called shamans (SHAH muns), had power over the spirits. The shamans were the priests of the traditional Mongol religion, called shamanism (SHAH muh NIZ um). The shamans were medicine men and witch doctors who used a special language when doing their magical rituals. 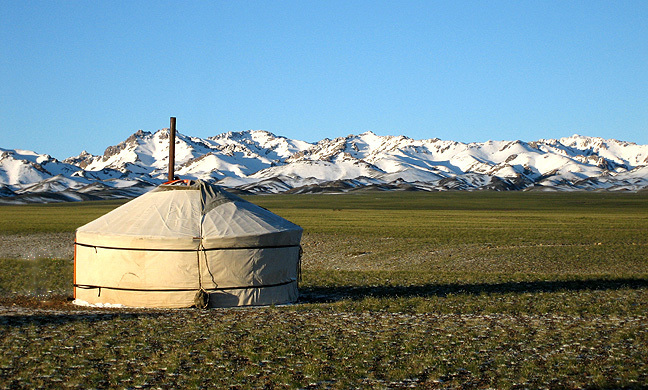 The Mongols talked to their shamans before making big choices and followed their advice. The later empire of the Mongols had many people with many religions, including Christians. The most important Christian group in the Mongol Empire was the Nestorian Church, sometimes called the Church of the East. These Christians were named for Nestorius, bishop of Constantinople. The Battle of Oroi-Jalatu in 1755 between the Qing and Oirat armies. The fall of the Dzungar Khanate. World War II Zaisan Memorial, Ulaan Baatar, from the People's Republic of Mongolia era. 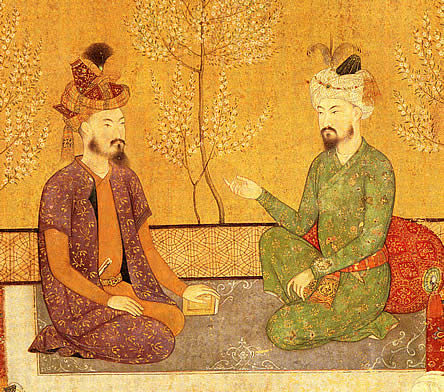 The Mughal Emperor Babur and his heir Humayun, The word Mughal, is derived from the Persian word for Mongol. This map shows the boundary of 13th century Mongol Empire and location of today's Mongols in modern Mongolia, Russia and China. 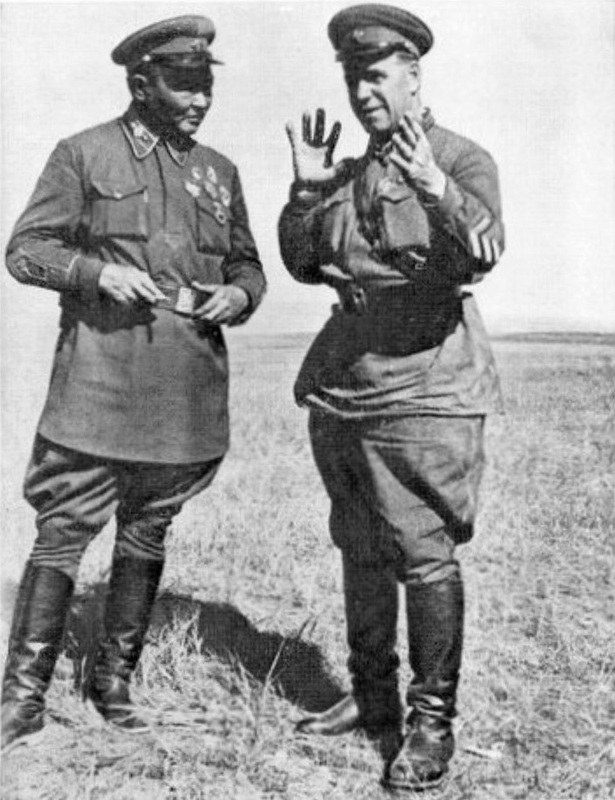 Dolgorsürengiin Dagvadorj became the first Mongol to reach sumo's highest rank. Mongols Facts for Kids. Kiddle Encyclopedia.